Photo: Blake Lively; Courtesy of AKM-GSI. Rarely see a mom-to-be look so light and fresh. I love how Blake Lively contrasted light and heavy (her flowy floral skirt and suede boots), warm and cool (the grey and mint based outfit and her warm rich brown boots). A pair of trendy shades and a swipe of red lipstick are best accessories during my pregnancy too. Best of all? 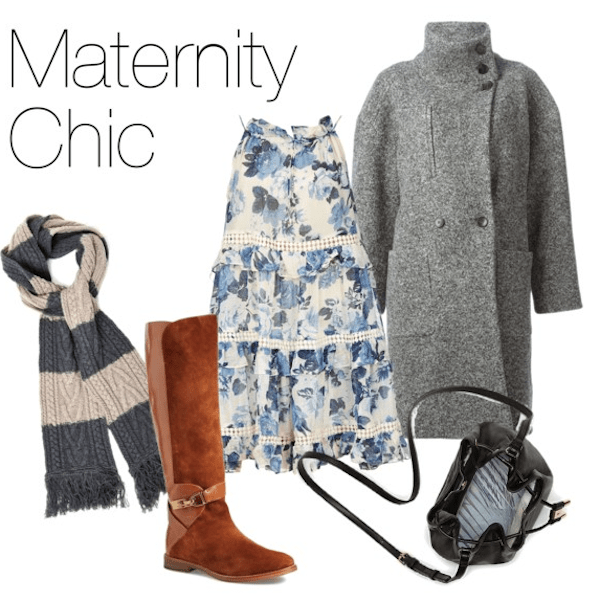 All the pieces can be worn post-pregnancy! As a mom-to-be, I definitely appreciate my mom more than before. As I said in my “mother’s day gift idea” entry, moms love us much more than we can imagine! The unconditional love started when we first appeared in her belly. She already loved us deeply long before she knew our gender and how we would look like. So treasure her more, hug her more! To all the moms and moms-to-be: Happy Mother’s Day! To all the lovely followers who sent me warm emails since I announced my pregnancy, I want to give you a big hug! Thank you for being on this journey with me! Thank you! I’m having a baby boy and my due date is Aug 30! This is a snap from a few days ago. I’m wearing: Calvin Klein trench coat, New York & Company top, Asos cross body bag, Old Navy maternity leggings, Tory Burch flats.